The images of Phoenix photographers David Moore and Jason Grubb, and Hermosillo photographers Juan Rubalcava II and Luis Gutiérrez will be on display at the Museum of Art of Sonora (MUSAS) from January 23 – February 28, 2014. 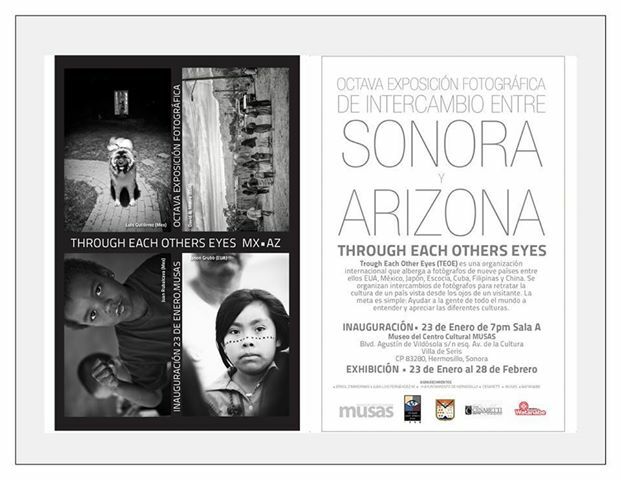 The opening night reception of this 80-print exhibit will be held at MUSAS in Hermosillo beginning at 7 p.m. Thursday (Jan. 23). Come join us to celebrate our eighth photo exchange with photographers from Sonora! This entry was posted in Annual Report photography, Arizona Photographer, Camerawerks commercial photography studio Phoenix arizona, camerawerks studio, catalog photography, commercial Photography, Legendcity Studio, phoenix arizona photography studio, Phoenix Arizona product photographer, Phoenix Still Photography, product photography, Still Life Photography, Studio photography, Travel Photography, Uncategorized on April 16, 2014 by Camerawerks. Camerawerks combines the creative talents of commercial photographers Jon Balinkie and Jason Grubb. Business partners since 2000 and friends long before that. Its our longstanding commitment to finding the shot and having fun while doing it that keeps our clients coming back to us. Working with two photographers opens up different perspectives,different styles and different solutions to your shoot,ensuring you get the shot you need. And it allows us to be more accommodating with your schedule and deadlines,which certainly ups client happiness. Camerawerks is located in Downtown Phoenix at Legendcity Studios. They specialize in Product and People photography in studio or on location.